Boeing, Volga-Dnepr Group and CargoLogicHolding have signed a package of agreements that will further optimize the cargo transportation leaders’ airplane fleet and global operations. The deals, announced at the 2018 Farnborough International Airshow, include a letter of intent (LOI) to acquire 29 Boeing 777 Freighters, confirmation of an order for five Boeing 747-8 Freighters, the purchase of a crew pairing solution, and an agreement to work together on future freighter projects. Volga-Dnepr Group is among the world’s largest Boeing 747 Freighter operators. The Group, and its subsidiaries and strategic partners have leveraged the jet’s unique cargo-loading and cargo-carrying capabilities to build an unmatched global network for transporting unique, oversize and heavy cargo. Volga-Dnepr said it wanted to add more 747-8 Freighters to its fleet and affirmed a commitment to purchasing five more of the jets valued at $2 billion in current list prices. While the Group and its partners have largely built its business on very large four-engine freighters, it now plans to expand its future fleet options with a commitment for the twin-engine 777 Freighter. CargoLogicHolding intends to order 29 Boeing 777 Freighters, valued at $9.8 billion according to list prices. The airplane’s unmatched range and significant cargo capacity promises to open up significant network and growth opportunities. The package of agreements also includes a commitment for both companies to explore other freighter solutions, such as new production 767 Freighters or converted cargo jets such as the 737-800 Boeing Converted Freighter. With the resurgence in the air freight market – demand grew nearly 10 percent last year – Boeing has seen a big spike in interest for cargo jets. Boeing has now captured more than 100 orders and commitments for production and converted freighters this year. Volga-Dnepr Group also uses Boeing Global Services to improve its offering for its customers. Its airlines use offerings such as Fuel Dashboard, Electronic Charting, Airport Moving Map and other advanced services, many of which are powered by Boeing AnalytX. As part of the agreements, Boeing Global Services will provide AirBridgeCargo – a Volga-Dnepr Group airline – with a Crew Pairing solution to support the planning and operation of the airline’s 300 crew members. The program creates optimized work duties, improving crew efficiency and improving airline productivity. Cargo Logic Holding Limited is the private holding company based in the United Kingdom. 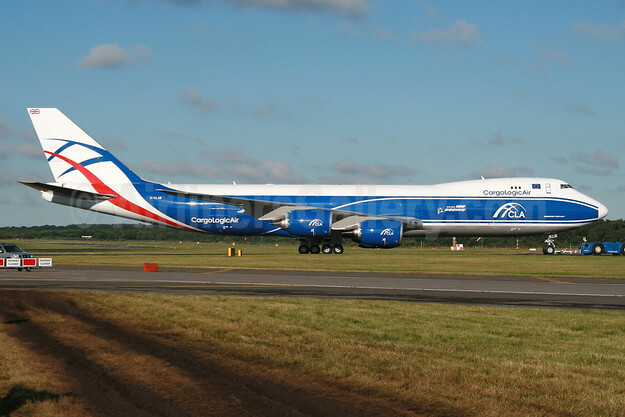 It is a unique platform that unites under its umbrella the International Group of the Cargo Airlines, with CargoLogicAir, the only British all-cargo airline, being its main member, which started its commercial operations on the global market since early 2016. Top Copyright Photo (all others by Volga-Dnepr Group): CargoLogicAir-CLA Boeing 747-83QF G-CLAB (msn 60119) FAB (SPA). Image: 933746. This entry was posted in CargoLogicAir, Volga-Dnepr Airlines, Volga-Dnepr Group and tagged Boeing 747-83QF, CargoLogicAir-CLA, G-CLAB, msn 60119, Volga-Dnepr Group on July 17, 2018 by Bruce Drum.